By Jurgen Robyns & Veerle De Keersmaecker. 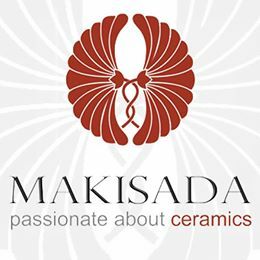 Makisada Ceramics is a small ceramic studio that pride themselves on the quality of its pieces. The Makisada logo shows two lotuses, entwined as they reach for the water’s surface. The lotus is one of the most significant representations of Buddhist teaching, with its roots deep in the mud, while its stem reaches to the surface, so that she can show her pristine incarnation of natural beauty. This movement signifies the development of our soul from the mud of our modern society in which mass production now takes a prominent place. Despite these rapid changes, one of our main goals is to remain faithful to a wide range of traditional techniques, and we do not engage is mass production from concept to delivery. We believe that the time-consuming process of creating new work is what gives our creations a soul. Pieces are patiently formed and glazed by hand, in order to ensure maximum control of the whole creation. During the whole process, we keep our utmost attention to our environment. Commissions can be requested through us here. Some examples of works from Makisada.